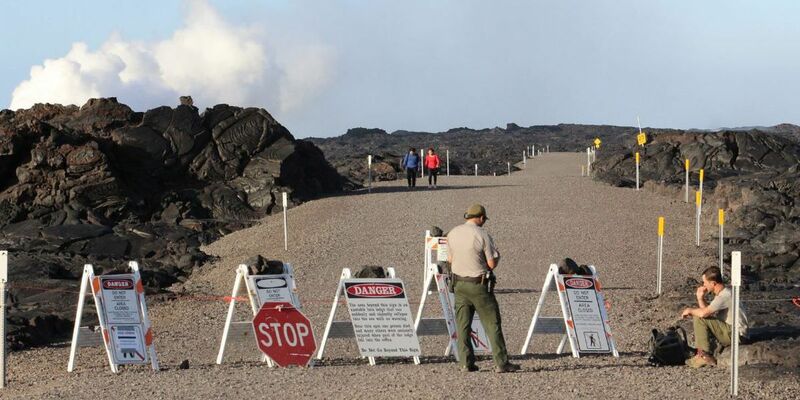 HAWAII VOLCANOES NATIONAL PARK, BIG ISLAND (HawaiiNewsNow) - Authorities are cracking down on visitors entering an off-limits area inside Hawaii Volcanoes National Park to get a closer look at the lava spewing into the ocean. National Park Service law enforcement officers have cited 28 people since a large delta collapsed a month ago, forming a fire hose of lava. "What's unusual about this one is just how long it has persisted," explained Matthew Patrick, a geologist with the USGS Hawaiian Volcano Observatory. "In most cases, you can get a lava delta forming within a matter of days and things just kind of tend to tube over." John Tarson, owner of the tour company Epic Lava, said he has seen people in the closed area around the ocean entry just about every day since the lava bench crumbled on New Year's Eve. "There were a couple of tourists who were perched on a little ledge, looked like maybe no more than 50 feet from the fire hose, something like that, and there's big explosions, pieces falling all around them," he said. Visitors cited for "violating a closure" must pay $130. The National Park Service has started to boost manpower near the ocean entry. "The closures are very well marked by signs, augmented by rope lines. We also have park rangers and eruption crew staff assigned to the coastal area," said Jessica Ferracane, public affairs specialist for Hawaii Volcanoes National Park. A team from the Hawaiian Volcanoes Observatory briefly inspected a ground crack in the sea cliff just above the ocean entry this past weekend. Geologists said the temperature inside the crack that is nearly a foot wide is up to about 428 degrees Fahrenheit. "Obviously this is a sign that the immediate area around the ocean entry is potentially unstable and it could collapse in the future," Patrick said. The National Park Service estimates that about 2,000 people visit the public viewing area each day. The site is 900 feet east of the hazardous ocean entry. "The bottom line is we don't want anybody to die out there, and whether people realize it or not, whether they understand the level of danger or not, it is extremely dangerous," said Tarson. The USGS estimates that 1 to 2 million gallons of lava flows into the ocean each hour. Experts aren't sure how long the lava stream will last.